If you’re claiming for water damage to your home, finding professional insurance repair builders can be a difficult task. However, it’s important not to rush and just choose any builder to get a quote for your repairs. As most builders are not trained in insurance, they aren’t usually interested in quoting for insurance repairs. This is why many of them don’t turn up to look at the job. Or if they do come out, they never get back to you with a quote. IC Assist however are different! We won’t waste your time, we will turn up and we will forward a comprehensive quote direct to your insurer. Not only that, but we also manage your entire claim. FREE Claims Management Service – a unique service not offered by most other builders. Our FREE Claims Management Service takes away all the stress of claiming for damage to your home. We will protect your interests and deal with everything on your behalf. Initially our Claims Manager will carry out a FREE no-obligation survey. During this time, he will document the damaged areas and discuss everything with you in detail. He will then forward a list of recommended repairs to your insurer for their approval. At this point, it is likely that your insurer will send a Loss Adjuster out to inspect the damage. But don’t worry, our Claims Manager will represent you during the meeting to ensure a fair settlement is agreed. 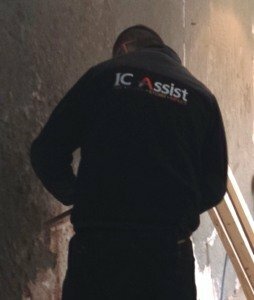 Once your insurer authorises us to proceed, we will then instruct our contractors to carry out the reinstatement work. Your claims manager will then manage all works through to completion. There is no charge for managing your claim, providing we carry out all the work authorised by your insurer. (Any policy excess however, will still apply). Our wide range of building services caters for all types of property damage claims. Most insurance claims require several skilled tradesmen to professionally restore a property. We have a carefully selected team of; plasterers, decorators, plumbers, tilers, electricians, carpenters, electricians etc. This allows us to provide a complete building repair service following damage to your home. If you’re claiming for damage caused by a leak or flood, our water damage restoration and drying service takes care of everything. From a minor repair to a damaged ceiling, flooring and joists, to a complete kitchen, bathroom or property refurbishment. We can also mitigate the extent of the repairs by installing our drying equipment immediately. This not only prevents damage to the fabric of the building, but also allows the renovation work to start sooner. We also provide an Asbestos sampling, testing and removal service for claims involving damaged Artex ceilings. We’re not like most other building companies. We specialise in managing home insurance claims. As insurance repair builders, we have a lot of experience managing property claims. We are totally independent and will represent you to ensure your insurer handles your claim fairly. Over the last 7 years, we have successfully represented our customers to ensure they received a fair settlement. During this time, we have dealt with many different companies such as; Ageas, John Lewis, Zurich, Churchill, AXA, NatWest, Legal & General, Aviva, Allianz, Halifax, Principality, Lloyd’s, NIG, Ecclesiastical, Co-op, NFU, Nationwide, Integra, More Than, Just Landlords, Santander, Swinton, Payment Sheild, Covea etc. We have also negotiated and settled claims with Loss Adjusters and validation companies appointed by insurer from: Cunningham Lindsey, Crawford, Woodgate & Clarke, Ellis May, Imperial Consultants, GAB Robins, Asprea and many more. So no matter who your insurer is, or which Loss Adjuster they appoint, IC Assist can help. We take the stress out of making a property claim. Dealing with a water damage insurance claim can be an extremely time consuming and stressful task. But this is not the case if you choose IC Assist to manage everything on your behalf. We will deal with all the stresses that come with managing every aspect of your claim. This ensures you have a claims experience that is easy and stress free. So please don’t waste your time arranging multiple quotes. As usually, most insurers and Loss Adjusters are able to work with our comprehensive quote. Don’t just take our word for it. Take a look at some of the feedback we have received from our customers on Google, Facebook and My Builder. You can also see handwritten testimonials and customer surveys. Your insurer has someone representing them and you should to – especially following an escape of water. Why? Because most insurance companies send out Loss Adjusters or validation companies to act on their behalf. Their main purpose is to settle for the lowest possible amount and usually they are inexperienced and overworked. This means they don’t scope the repairs correctly and their settlement offer is insufficient. We come across this all the time. In fact this is what makes our job so rewarding. We love having the knowledge and experience to challenge their offers and do what is best for our customers! We put so much time and effort into ensuring our customers get a fair settlement, following damage to their home. Firstly, we meet the Loss Adjuster/claims validator at your home to discuss the reinstatement work required. Then following their visit, we request a copy of their scope of works for us to review. This is vital as, despite seeing the damage themselves, they still overlook a lot of the work required! After we carefully review their scope, we will the advise them of everything they’re missing. We will also justify why this work is necessary. This results in a lot of very happy customers. As without IC Assist’s help, the settlement offered would not have covered the costs to professionally restore their home. Please take a look at before, during and after pictures of water damage insurance repairs we have completed.